This is a system created to find out the colour of anything, by querying and aggregating image data from Flickr, a popular online photo sharing community. It is an attempt at answering a potentially complex and abstract question in an objective manner, by using simple algorithms on data originating from subjective human perceptions. THE COLOR OF uses an averaging algorithm on the colour pixel values of the queried images, displaying the result incrementally as each picture is loaded. Taking the assumption that random images will average out to become grey, we can attribute any colour bias which deviates from grey, to the term as searched. Any further interpretation is then up to the user. i typed in persian cat. that's an interesting approach for a website lol, a bit pointless, no? 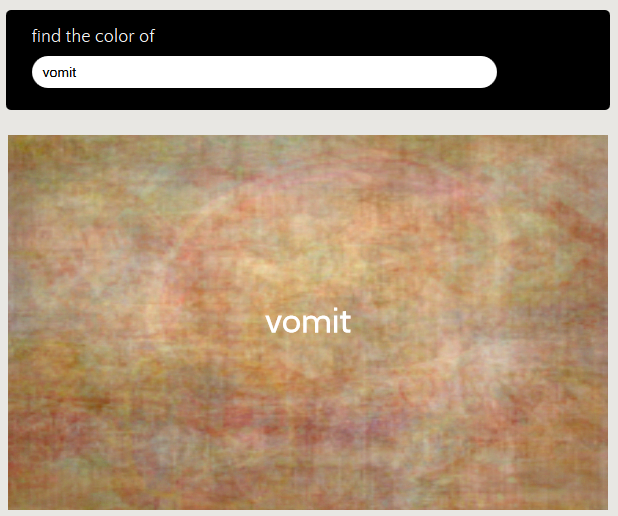 Obama and Vomit look very similar. If the women don't find ya handsome. They should at least find ya handy.